Don't just fume, take action, writes SAGE's Michael Adams. The Supreme Court’s decision last week in Masterpiece Cakeshop — often referred to as “the wedding cake” case — was not exactly what the LGBT community hoped for. The court’s decision was narrow and specific to the facts of the case, with the court citing what it saw as a disrespect for religion in earlier proceedings before the Colorado Civil Rights Commission. Many LGBT advocates reacted optimistically, because although the court sided with a Colorado baker, who claimed that his religious beliefs gave him a right to refuse to make a wedding cake for a gay couple, it did not give religious business owners a broad license to discriminate against LGBT people. At the same time, many who oppose equality for LGBT people and our relationships heralded the decision as a major breakthrough and an important success in chipping away at the rights of LGBT people. While the consequences of last week’s decision may be unclear, what is crystal clear is that LGBT people have a long and arduous fight ahead of us to preserve the equality we’ve won and to keep making progress. The forces that championed the Colorado baker’s cause are the same ones that have succeeded over decades in gradually chipping away at a women’s right to choose. That makes those of us at SAGE, as advocates for LGBT elders, both deeply concerned and fiercely determined to fight back and not cede an inch of ground. As SAGE pointed out in a key legal brief to the Supreme Court, our elders have a huge stake in the fight over whether freedom of religion can be used to justify discrimination against LGBT people. Since LGBT elders are much less likely to have children and much more likely to be single as they grow old, they heavily rely on elder care in their later years. Yet 85 percent of elder care providers in the U.S. are religiously affiliated. Think what it would be like to grow old as an LGBT person if 85 percent of care providers were free to turn you away or otherwise discriminate against you. That danger is very real. A study several years ago by Justice in Aging pointed out that there is already widespread discrimination against LGBT people in elder care. And 60 percent of LGBT older adults surveyed by AARP earlier this year think they may be refused service, receive limited care, or be harassed in a long-term care setting. In fact, such a case already exists in Chicago, where Lambda Legal is defending Martha Wetzel, an older lesbian who suffered harassment, discrimination, and violence by residents at a senior housing facility after disclosing her sexual orientation. A new ad released today by SAGE and the Movement Advancement Project illustrates the devastating harms of this type of discrimination. 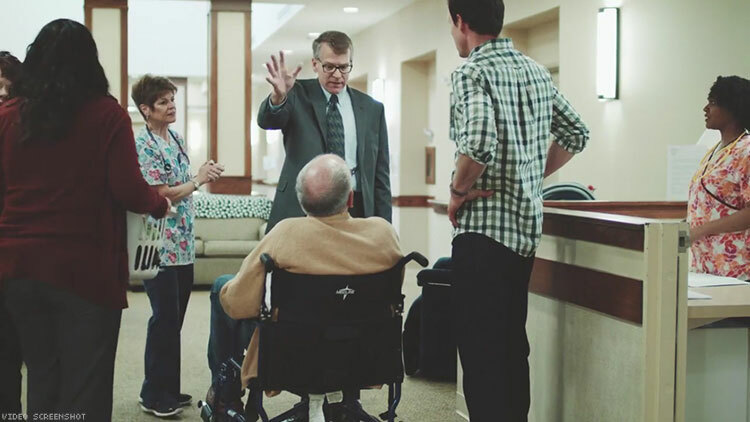 The ad, called “Nursing Home,” features an older gay man and his family on the first day he moves into an assisted living facility. When the director of the facility learns the man is gay, he refuses to allow him to move in. This is what could happen if a license to discriminate is sanctioned in this country. Last week’s court ruling kicked the question of religious exemptions and nondiscrimination laws down the road in many respects. It’s unlikely that those working against us will be discouraged, particularly given the fact that the Trump administration is championing their cause, siding with the Colorado baker and pushing a license-to-discriminate agenda in federal agencies. So what do we as LGBT people need to do to stop license-to-discriminate initiatives from gaining traction? First, we need to have the backs of those in our community who are most vulnerable to this discrimination, including our LGBT elders and LGBT people of color. That’s why we encourage everybody to join the Care Can't Wait campaign and take a pledge to stand up for LGBT elders and against discrimination. If you take the pledge, you’ll be informed about important next steps to protect our rights from attacks in your state or at the national level, and provided with resources on how to speak out. Second, we have to remember that in many parts of the country we still don’t have nondiscrimination protections. In the majority of states, there is no state law explicitly prohibiting discrimination against LGBT people, and there is no federal LGBT rights law. That means we all need to support efforts to enact laws that protect all of us. Pushing for progress at the state level is even more important now, since it’s unlikely to come at the federal level as long as Trump is in the White House and anti-LGBT forces control Congress. For LGBT elders specifically, we need to support laws like the one passed recently in California that creates a “bill of rights” for LGBT people receiving elder care. Third, we need to have the backs of our elders by aggressively opposing any attack against them and pushing for proactive protections. That means we need to fight efforts like last year’s attempt by the Trump administration to remove LGBT elders from a key federal survey about senior services. (Fortunately, that effort was beat back after a fierce campaign of resistance led by SAGE.) And, we need to support state and federal proposals that would classify LGBT elders as a population of greatest social need, since that designation would make it much harder to discriminate against older LGBT people in senior services. Fourth, we must push care providers across the country to treat LGBT elders with respect. An important first step is to encourage providers to take the Care Can’t Wait pledge to care for our elders without discrimination. Providers should also take advantage of training programs like SAGECare, which give them the information and tools they need to provide LGBT elders with the discrimination-free respect they deserve. After the Supreme Court’s decision in the Colorado baker’s case, we have a big fight in front of us to protect not just LGBT elders but all LGBT people. Now is the time to commit to step up to the plate and make sure our voices are heard so that there is never a license to discriminate. MICHAEL ADAMS is the CEO of SAGE.